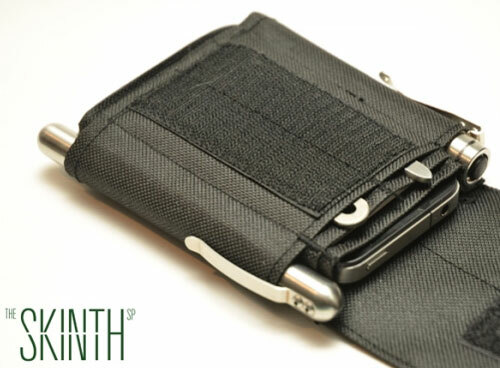 Skinth makes several multi-tool sheath products, and now, a smartphone case as well. 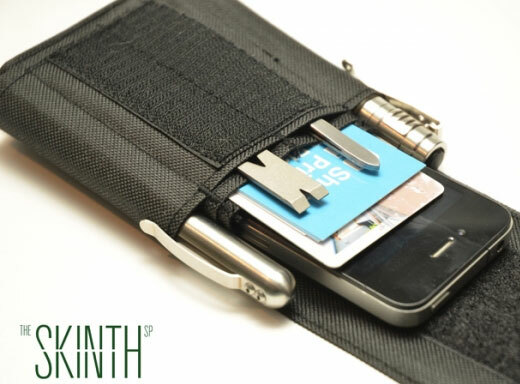 The Skinth SP is designed to hold iPhones 3-4S and other similarly sized models. 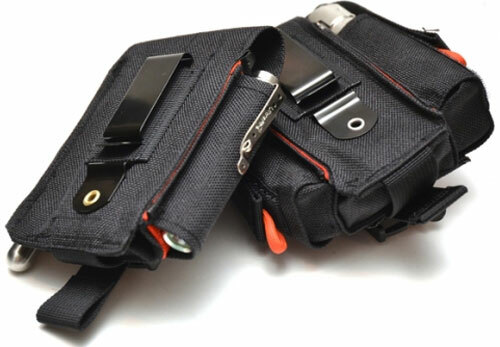 In addition to the main compartment, the smartphone sheath features two open-end side pockets that can hold pens, markers, or slim flashlights. 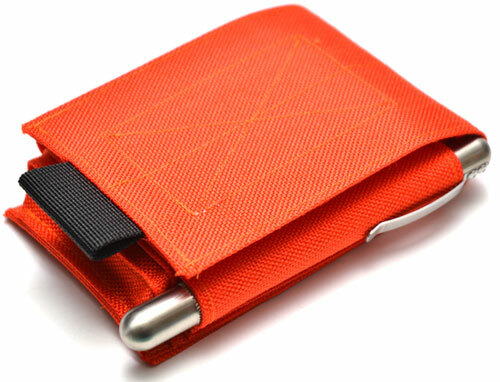 A thin front pocket is large enough to hold a couple of credit cards, business cards, or even a small folding knife. Pricing is $45 plus $6 shipping. As with their other products, I don’t see 45 dollars plus six dollars shipping. This is something that could easily be made by someone with a little sewing saavy. It’s a neat item and I love the fact that it’s functional and lightweight. They have to be kidding themselves however, when it comes to the cost. It is so easy to be an armchair critic. But it is much harder to stand behind the attitude. I challenge Robert to make something similar for less money. Put your money where your mouth is! Do you (Robert), have what it takes to make something for less? Give me a break Dave. You sound like a sales rep. If you’re willing to fork over 50 bucks for this, have a field day. No I hear you Dave. Robert you are so awesome it shouldn’t be hard for a wonderfully skilled person like you to whip one up and prove us both sales reps and idiots right? Unless we’re not? Oh please, spare me Jonathan. Again, if you’re willing to spend over fifty bucks on this, have a good old time. While you’re doing that, stop boring me with your rhetoric. I could go into a page long rant, but I’ll keep it short. There are alot of “Roberts” out there… +90% of the population is spoiled by cheap products fabricated in 3rd world countries. We all seem to think we know what things should cost based on Walmart pricing, but do you ever stop and think what those items would cost if they were manufactured in your country? What do you think your boss thinks of the work he gets out of you for $50? The point is you need to recognize that you are actually paying the real price of what things should cost when you buy something made here. I will gladly pay $50 for a quality hand made Canadian product, and will wear it with pride. Once they run out of 3rd world countries, everything is going to cost alot (assuming we dont become the 3rd world country by then). Thanks for keeping it short there Jeremy. I don’t see the price being that big of a deal, my grandmother (God Bless her) had a sewing machine and she was a whiz with it could probably make one of these sheath and I totally agree that the price would be worth what they are asking. If you don’t want to buy it, don’t. If i want to throw down 70 to 100 USD to protect a mutlitool, flashlight and few other items that are worth a couple of hundred, thats decision. This is done with 1000 Denier Cordura! Not every sewing machine can accomplish the job! Besides all, you have the design work that creates different sizes and pockets combinations for various types of multitools and other items! I could do something similar? Certainly! Within the same value? Perhaps. With the same quality? Maybe… And with the comfort of receiving at home without sweating? Absolutely not! Imports for my country is complicated and taxes are high. Otherwise I would buy one with a smile!